As Another Delco Guy emerged from his slumber this morning, he noticed two guys wandering around the back yard. Thankfully I realized that they were the pool guys before I called the police. 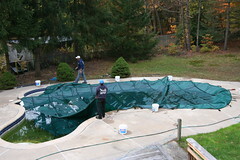 Tom and Benito from Riverton Pool and Garden were there to install our new Merlin SmartMesh pool cover. It's a project i have had on my list since we moved into the new house. We've all got projects on our list and not all of them are house related. So that's this week's question! What Four Projects Do You Really Want to Get Done? 2. My Flickr account is a mess and I would like to get titles and locations on all the photos. 3. I need to go through my clothes and get rid of the stuff that I don't wear or that has magically shrunk. 4. I need to renovate my personal physical condition! Have a great weekend and GO PHILS!!!! -Go through thousands of photos (printed ones) and do something with them. -Update my web sites and reroute everything to a new publishing format. If you want me to review the chocolate covered pretzels, just send some over!! Scanning photos is no fun, but it's very satisfying to know they are safe!